Scott Plous, professor of psychology, was named the Connecticut Professor of the Year by the Carnegie Foundation for the Advancement of Teaching and the Council for Advancement and Support of Education (CASE). This designation means he is among only 43 professors working in the United States, the District of Columbia and Guam to be considered a 2006 U.S. Professor of the Year. It was quite a surprise, as you can imagine,” Plous says, modestly. The goal of the U.S. Professors of the Year Program is to increase awareness of the importance of undergraduate instruction. In recognizing faculty members for their achievements as teachers, the award gives institutions an opportunity to celebrate excellence and provide models for faculty and students. 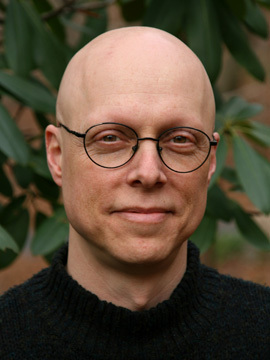 Plous, who joined the Wesleyan faculty in 1990, is an expert on psychology of prejudice and discrimination, decision making, and the human use of animals and the environment. The CASE-Carnegie award is Plouss second major teaching award. In 1998, he received Wesleyans Binswanger Prize for Excellence in Teaching. Plous credits Ruth Striegel-Moore, the Walter A. Crowell University Professor of the Social Sciences and professor of psychology, for nominating him while she was chair of the Psychology Department. Im deeply grateful to Ruth for her support of my teaching, and I also owe a huge debt to the wonderful teaching apprentices and course assistants I work with, he says. Plous is a Fellow of the Association for Psychological Science and the American Psychological Association, and has been the recipient of several APA division awards, including the William James Book Award, for his book The Psychology of Judgment and Decision Making, the Gordon Allport Intergroup Relations Prize, the Otto Klineberg Intercultural and International Relations Award, and the Society for Personality and Social Psychology Award for Distinguished Service to the Society. In addition, he is a faculty associate of the Tufts University Center for Animals and Public Policy and is on the editorial board of Analyses of Social Issues and Public Policy. The Professor of the Year program is the only national initiative specifically designed to recognize excellence in undergraduate teaching and mentoring. The Council for Advancement and Support of Education began the program in 1981, and the Carnegie Foundation for the Advancement of Teaching became a partner and major sponsor the following year. Winners of the award must meet the programs demanding criteria. The primary characteristic the judges consider is an extraordinary dedication to undergraduate teaching demonstrated by the impact on and involvement with undergraduate students; scholarly approach to teaching and learning; contributions to undergraduate education in the institution, community and profession; and support from colleagues and current and former undergraduate students. For this achievement, Plous was invited to a congressional reception in Washington, DC, and given a framed certificate of recognition.